The GeoAIR opened it's residency program in January 2010. This is a self directed residency program, that offers primarily curators and culture producers the opportunity to base themselves in Tbilisi, Georgia and use this location as a starting point to build networks, meet artists, cultural institutions and curators from the Caucasus region, and develop and deepen their knowledge and research of the Caucasus context. In return local artists, curators and organizations will have the opportunity to extend their knowledge about the innovative ways that many international curators are working. GeoAIR has designated her residency mainly for curators or cultural producers because it feels that they are most able to affect multiplier effects through exchange and production and are more equipped to use the residency as a platform from which to jump for to instigate future collaborations between the resident and artists and organizations form the Caucasus region. 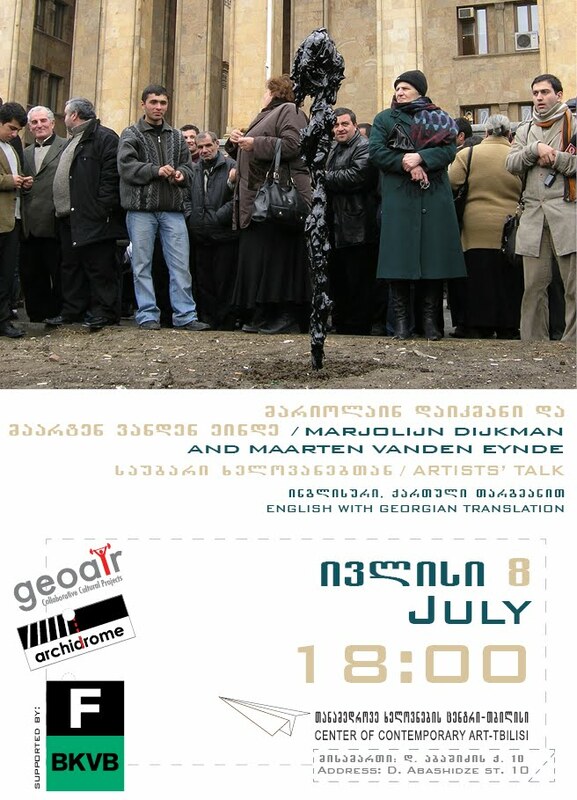 Residents are expected to make at least one public presentation of their work or related topic for Georgian public. Any additional relevant information about yourself, should be sent with the same e-mail. The e-mail must also include the information about the intended dates of the residency. The aim of GeoAIR is to encourage different ways of thinking about and approaching issues of artistic and professional development, dialogue, exchange, and research within the Caucasus context. GeoAIR offers a dynamic residency model designed around tapping into the regional context of the residency. The program encourages the resident to delve into his/her perception of this context and to revisit their perception and question it. This is viewed as mutually benefiting for the curator’s repertoire and professional development in general and for the region’s exposure to new artistic experiences. GeoAIR does not propose a set program or conditions. Instead GeoAIR is responsive to ideas and opportunities that emerge from our network and proposed resident projects. The term self directed residency reflects this approach. GeoAIR assists in the realization, investigation and conception of new productions and research through connecting the resident with the suited organizations, curators, artists, venues and research opportunities in relation to the proposed project. GeoAIR’s flexible platform enables the program and the resident to work with a wide variety of partners on innovative project collaborations. This structure addresses the need for information and knowledge exchange and recognizes the potential for wider impact and multiplier effects and encourages the creation of this ripple effect both in and outside Caucasus region. In addition GeoAIR offers a substantial archive that sets out to map the art activity within the Caucasus region, and asks from each resident to contribute to this database. In this archive one will find artists, curators, writers and organizations who have contributed to past and current GeoAIR projects and initiatives and additional information about the GeoAIR network and activities in the Caucasus including catalogues, reviews, artist portfolios, art magazines and other publications. The database reflects the history of people and places that, in the end, define GeoAIR and outlines the potential of the region and its future possibilities. The GeoAIR residency program will start with a pilot year from 2010. In this year the residents that will stay at GeoAIR are selected by invitation only. The aim of the pilot year is to get a better insight into the variety of expectations and desired goals of the residents, participating organizations and artists. Our goal is to engage in a constructive dialogue that will identify the main challenges of this residency program while discussing possible solutions and potential changes. For the pilot project GeoAIR will invite specific candidates; operating in the field of visual culture, playing a dynamic role in mediating, structuring and altering artistic contexts and relationships and with a critical understanding of how one negotiates ones own position within contemporary discourse. These candidates will each have their own approaches and goals and will challenge the program to offer the most flexible and productive platform from which they can operate. While the GeoAIR residency program is running its pilot year it is also setting up a financial structure that will allow the program to run its best course and support the residents in achieving their goals. The input and feedback from the pilot residents in this first year will be crucial for the development and effectiveness of the program. This program is managed on a not-for-profit basis. Residents will receive their own housing (50qm) and office-style studio (10qm) with access to all GeoAIR facilities including the archive. The program provides residents access to the vast GeoAIR network that includes individuals spanning different disciplines, professions, and regions. GeoAIR provides residents with all the necessary support and connections to help them achieve their proposal and research goals primarily in Georgia, Armenia and Azerbaijan. A related community based network can provide professional and personal support to the artists.